For a country, the banks are the heart and soul of the financial system. Therefore, the sound and efficient performance of the banks are very much essential for the sustenance of the financial system or economy of the country. Like other organizations, banks are also dependent upon the consumers for their survival in the market. Modern banks play vital role in promoting economic development of a country. Banks provide necessary funds for executing various programs underway in the process of economic development. They collect savings of large masses of people scattered throughout the country, which in the absence of banks would have remained idle and unproductive. These scattered amounts are collected, pooled together and made available to commerce and industry for meeting the requirements. BRAC Bank Ltd. is one of those banks that plays important role in the economy of Bangladesh. There are thirty six branches of BRAC Bank all over the country. The activities of different department are differences as per the important of the department. The format of the report will be followed as per the guideline given by the North South University authority. BRAC Bank Ltd, a full service commercial bank with Local and International Institutional shareholding, is primarily drive by creating opportunities and pursuing market niches not traditionally met by conventional banks. BRAC Bank has been striving to provide “best-in-the-class” services to its diverse range of customers spread across the country under an on-line banking platform. Today, BRAC BANK Limited, one of the latest generation of commercial banks which started its journey on the 4th of July 2001 with a vision to be the absolute market leader through providing the entire range of banking services suitable to the needs of modern and dynamic banking business as well as to promote broad based participation in the Bangladesh economy through the provision of high quality banking services. The unique strength of BRAC Bank lies in the fact that BRAC one. Manage vehicle fleet of the bank. •Negotiate contracts for provision of outsourced services. •Ensure comfortable and secure working environment. •Insurance coverage of all bank assets. • Bold – BSSO will be BOLD on behalf of their guests and colleagues. They will be the first to greet, first to listen, first to make suggestions, first to satisfy even the unexpressed needs and to bid a fond farewell. • Reliable – BSSO will take full ownership in serving their guests to their complete satisfaction. • Appealing – They will ensure that all guest touch points are appealing and inviting. Consistent – It is also necessary to ensure that guest experience quality is consistent in all aspects across all guest service points all the time. The Bank operates under a “double bottom line” agenda where profit and social responsibility go hand in hand as it strives towards a poverty-free, enlightened Bangladesh. A fully operational Commercial Bank, BRAC Bank focuses on pursuing unexplored market niches in the Small and Medium Enterprise Business, which until now has remained largely untapped within the country. The management of the Bank believes that this sector of the economy can contribute the most to the rapid generation of employment in Bangladesh. · • Compliance with the issue of Bangladesh Bank & BRAC Bank Ltd.
· • Recovery of Bad debts. BRAC Bank a leading private commercial bank stated her journey on 4th July, 2001. In just 11 years she was able to prove herself as one of the fastest growing bank in the country. Today she holds a dynamic network of 86 Branches, 21 SME Service Centers, 48 SME/ Krishi Branches, Over 300 ATMs and 400 SME Units offices across the country. BRAC Bank is among the last few organizations to have received a commercial banking license from Bangladesh Bank. Its headquarters are based in the capital Dhaka. The bank is partially owned by BRAC, the largest non-government organization in the world, International Finance Corporation, the private sector arm of The World Bank Group and Shore Cap International. Though BRAC Bank was formed with the aim to serve the millions of small and medium enterprises (SMEs) in the country. Having pioneered the concept of SME financing in Bangladesh, it is the fourth largest SME bank globally. The company also provides services within corporate and institutional banking, retail banking, as well as probashi banking, which specifically caters to non-resident Bangladeshis abroad. Other areas include customized treasury and foreign exchange solutions, and custody services. It ranks amongst the top banks nationally that processes remittances from abroad. With the vision of "Building profitable and socially responsible financial institution focused on Market and Business with Growth potential, thereby assisting BRAC and stakeholders to build a just, enlightened, healthy democratic and poverty free Bangladesh”, BRAC Bank Limited has started its journey in the Banking Sector of Bangladesh. Now, BRAC Bank Limited is one of the leading private bank in Bangladesh. BRAC Bank has received the commercial banking license from Bangladesh Bank in 2001. Since then it has established its name and branding with its quality of service and products. In a very short time BRAC Bank became one of the successful and fastest growing private bank in Bangladesh. BRAC Bank is owned partially by BRAC, the largest non-government organization in the world, International Finance Corporation (IFC), the private sector arm of The World Bank Group, and Shore Cap International. The head office of the bank is situated at Gulshan, Dhaka. 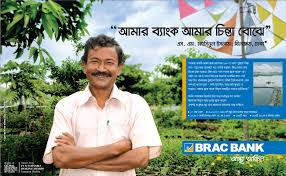 BRAC Bank operating its busness in whole Bangladesh. BRAC Bank is expanding its branch network rapidly through out the country. Currently, BRAC Bank has 100 Branches, 60 SME Service Centers, 3 SME/Krishi Branches, more than 300 ATMs and 424 SME Unit offices across the country. It has disbursed over BDT10,000 crores of SME loan and has over 500,000 individual customers who access online banking facilities. Its services cuts across all strata of clientele, be it corporate, retail or SME. BRAC Bank provide all sort of banking service to the mass people of Bangladesh. Among them, BRAC Bank is well known for its SME Banking in Bangladesh.